. : IS GOVERNMENT TYRANNY A REAL THREAT? IS GOVERNMENT TYRANNY A REAL THREAT? Is that right? Should you fear our government? Are these warnings the rantings of a few right-wing radicals, or is government tyranny truly creeping up on us? First, watch THIS VIDEO. Then read on. We are a country of laws and those laws are centered around our constitution. It is that document, to the exclusion of all others that make us who we are as a country. The rights to freedom of religion, of the press, to assemble and to redress grievances. Freedom from unreasonable search and seizure. The right to a speedy trial. To a trial by jury and to have a reasonable bail set and from cruel and from unusual punishment. It has been said about the first ten amendments to our constitution (our Bill of Rights 2) that the First Amendment is the basis for all of our freedoms and the Second Amendment is there to insure that the government doesn't forget about or attempt to deny us the other nine. So are they under attack? Are our rights as people and citizens at risk? Even religious employers now have to hire people who disagree and/or violate the employer's religious beliefs. Catholic employers now have to provide abortion coverage which violates the basic tenants of their beliefs. Our president even deliberately refuses to say “endowed by their Creator” when quoting the Declaration of Independence4. Or let's talk about freedom of speech5. Any speech that seems to anger someone; the actual basis of "Free Speech"(who complains about speech they agree with?) is now persecuted. Under the guise of reducing copyright infringement two bills currently before congress would, if passed "give the U.S. government the ability to shut down literally millions of websites"6. Prayers are currently being censored at military funerals7. To me, this is one of the most disturbing things I have ever heard this or any government be accused of. Then there is the very recent attack on the freedom of the press8. Just a few days ago it was revealed that the Obama administration secretly got the phone records of 20 phone lines from the Associated Press. Next they went after James Rosen, a Fox News reporter, going so far as to label him a "possible 'co-conspirator' in a criminal investigation"9. These outrageous attacks on our basic freedoms are only the most recent by Obama and his thugs. And now there is the all-out assault and condemnation of our Right to Bear Arms. 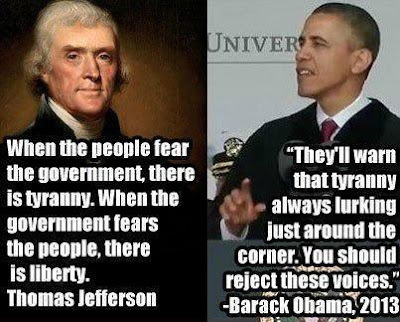 This was specifically what Obama was referring to in his " tyranny is always lurking just around the corner" comments. Many left-wingers are trying to say that the Second Amendment isn't needed any more. People say that since we have the police and military, the people don't need guns. In a talk about proposing gun bans, Obama said that since we elected the government, we needn't fear them. Did you vote for David Axelrod and Eric Holder? How about anyone in the IRS? I certainly didn't. And; Hey; Obama! Don't forget that over 49% of the people DIDN'T vote for you. So do we need guns to protect ourselves from the federal government? Let's face it, since the dawn of civilization, if a government wants to oppress and suppress its citizens, the first thing it has to do is disarm the people. Even Hitler didn't try to invade countries where the population was armed. He knew he would fail. We need guns to repel any invaders and to fight all enemies from without and within. An armed citizenry is the only deterrent to tyranny. Look at history. If you believe that the American government won't try to set up a dictatorship once we the people are disarmed and at their mercy, you are living in a fantasy world. Do we the people need to protect our right to keep and bear arms at any cost? Absolutely. The second amendment is the only thing allowing us to keep the first and third through tenth. Read the papers. Watch the news. Our very survival as a society is at stake. Next month: Is global warming real or a hoax? The answer may surprise you. Have a conspiracy you'd like me to research? Got a question about crypto?